Really I could have copied and pasted my review of the Bahrain race and used it again. The parallels between that one and the one in China just passed were spooky. 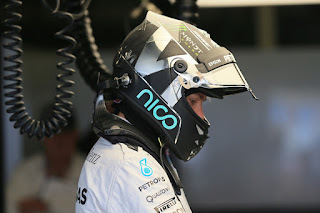 Not least for Nico Rosberg who once again had his three nominal rivals with races compromised by the time of the first turn, meaning that even that early the race was his barring the unusual. And the unusual never arrived. Also just like in Bahrain there was plenty to keep us entertained well behind the imperious Nico. Some fine comeback drives, and rather the soap opera between best-of-the-rest Sebastian Vettel and Daniil Kvyat.